In 2012 the Archbishops’ Council Faculty Simplification Group commissioned a working party to make recommendations for modernising and streamlining the faculty system. As part of this endeavour, and with the financial assistance of Historic England, ChurchCare - the Church of England's national resource - together with Exegesis, developed the Church Heritage Record: a digital database of church buildings integrated with a Geographic Information System (GIS), which can be used for planning and development control, but also fulfils an educational and engagement role. 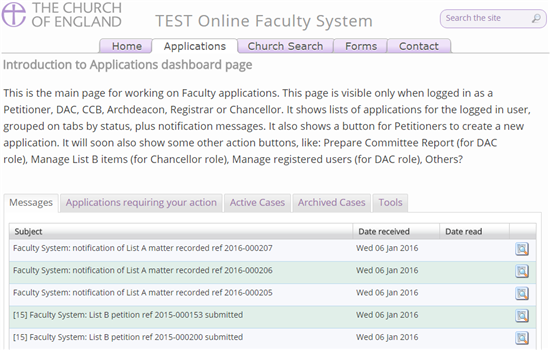 A major aim of the project was to develop an online faculty application system for the Church of England. This system is used to digitally process applications which propose changes to the fabric of church buildings, features within the church and the churchyard. The system aims to simplify the faculty application process by automatically inputting information about each asset from the Church Heritage Record (which has shared development with Church in Wales Church Heritage Record). Exegesis have developed a number of tools to simplify and automate the faculty application process. The system allows for the creation of legal forms for each application, required by the Church of England. It also allows users to keep up to date with their workload, providing them with a dashboard showing the applications and messages relevant to their role and any cases which require their attention. Users are also notified by email if they are required to work on an application. We have added a number of other useful tools, for example the automatic production of meeting agendas for the Diocesan Advisory Committee. Since its launch at the beginning of 2015, 21 dioceses have signed up and well over 1000 applications have been processed. Further information from Crispin Flower or Steve Ellwood.